Best Miami-Dade Neighborhood Map Evar! Thread: Best Miami-Dade Neighborhood Map Evar! 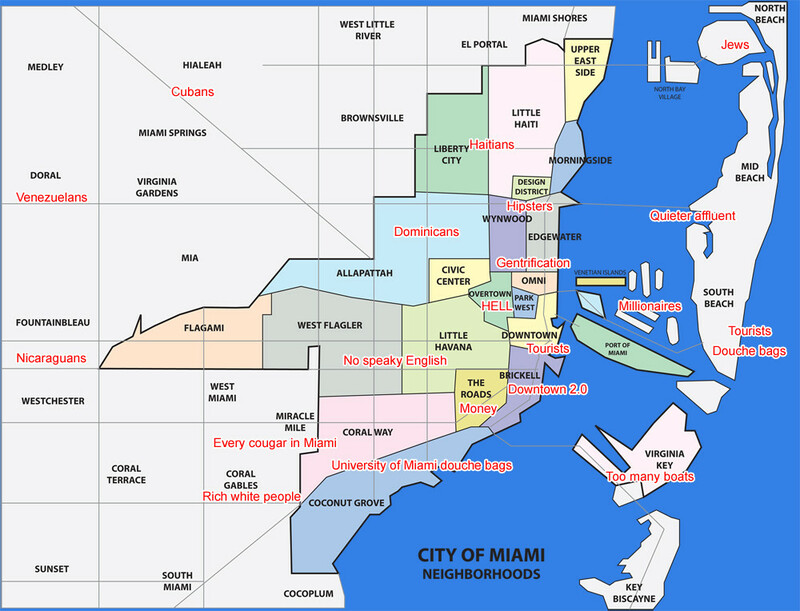 Note to future Miami residents and newcomers: this map is intended for humor purposes only, although it's pretty much accurate! "University of Miami douche bags"... Funny map. I'm going to move this thread to the "Living and Relocating" forum. Funny! What does Downtown 2.0 mean about Brickell? And what would the map say about Sunny Isles? Why does it say "Jews" up near Normandy Isle? I thought Normandy Isle is like "Little Buenos Aires"? Isn't the Jewish area is near 41st St. / Mid-Beach? I've read that part of 41st St is called, "Littel Tel Aviv"? It's a pretty funny map, overall. Last edited by GandJ; 07-28-2010 at 08:36 PM. Same thing popped at me! Gotta agree with Glenn, I didn't know Normandy Isle was known for its Jewish section! Re: Best Miami-Dade Neighborhood Map Evar! It should have 'no speaky english' all over the whole map. Do you live in Brickell or Sunny Isles? Could you describe the one you live in? I'm just curious because 1. I'm interested in learning more about Brickell to see if I'd want to live there. 2. My friend is moving to Sunny Isles and other that saying "it's nice" and the condo is a high rise on the water, he doesn't seem to know much about the place. I agree ... the map needs revision. Also, it's missing some sections. Funny you said that Maria. We selected the Brickell area for a downtown feel to compensate for our wilderness setting in CFL. Being on the water at the same time was what sealed the deal. Because of the the large farming community, you can also find lots of Mexicans living in Homestead. Most locals will tell you, the best Mexican restaurants in Miami are located out in Homestead. Very true Gus ... was wondering what would be a funny name for "Mexicans"
Isn't it folklore that Homestead was a major Puerto Rican community before Andrew ? Seems they all relocated to Orlando / Kissimmee. All kidding aside, I do think Brickell today is very much a "2.0" version of that whole east side/downtown/biscayne corridor attempt at revival. Edgwater, Morningside, El Portal and Miami Shores could be labeled as" First Time Home Buyers Who Paid Way Too Much For Their House." And don't more "Rich Latinos" live in Coral Gables now? Gus, I hear Edgewater/Morningside is also friendly with the gay community. Gotta have the gays thrown in the mix too!